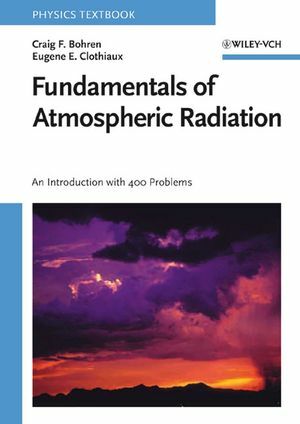 Meeting the need for teaching material suitable for students of atmospheric science and courses on atmospheric radiation, this textbook covers the fundamentals of emission, absorption, and scattering of electromagnetic radiation from ultraviolet to infrared and beyond. Much of the contents applies to planetary atmosphere, with graded discussions providing a thorough treatment of subjects, including single scattering by particles at different levels of complexity. The discussion of the simple multiple scattering theory introduces concepts in more advanced theories, such that the more complicated two-stream theory allows readers to progress beyond the pile-of-plates theory. The authors are physicists teaching at the largest meteorology department in the US at Penn State. The problems given in the text come from students, colleagues, and correspondents, and the figures designed especially for this book facilitate comprehension. Ideal for advanced undergraduate and graduate students of atmospheric science. Craig F. Bohren is Distinguished Professor Emeritus of Meteorology at the Pennsylvania State University. In 1988 he was elected a Fellow of the Optical Society of America. He is author of several books, his most recent book being 'Atmospheric Thermodynamics' (with Bruce A. Albrecht). Professor Bohren is the first recipient of the American Meteorological Society's Louis J. Battan Award for Authors. Eugene E. Clothiaux is an Associate Professor of Meteorology at the Pennsylvania State University. He remained at the Pennsylvania State University as a Research Associate from 1994-1999 before becoming an Assistant Professor in 1999. Prof. Clothiaux has written several contributions on millimeter-wave cloud radar and atmospheric radiation.